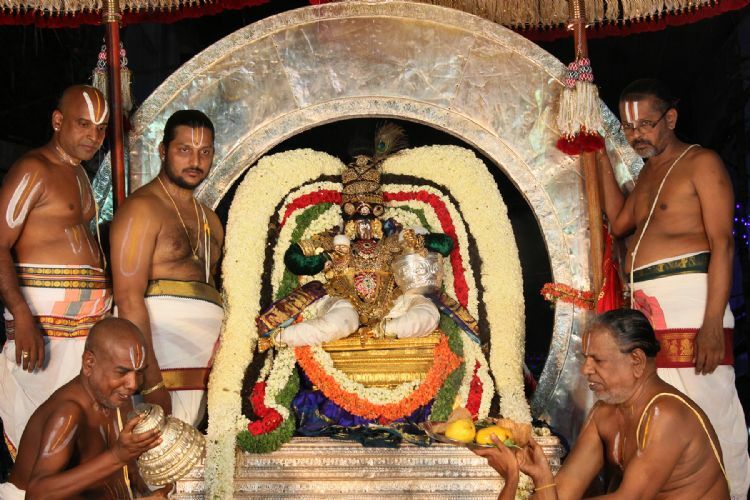 Tirupati, 31 May 2015: On the evening of seventh day of the Srivari Brahmotsavam in Tirupati, the presiding deity Lord Govindaraja rides atop a Chandra Prabha Vahanam in the form of Sri Venugopala swamy to the delight of thousands of devotees who gather around the four mada streets to witness the divine event. As per the scripts in the 'Purushottam Praptiyagam' Chandra is described as Lord Vishnu who as an invisible architect evolved solutions for all ills of the society. The Saint exponent Geeta Charya says 'Nakshatrana Aham Shashi' (I am a spot on the moon) indicating the presence of moon as an integral part of the celestial system. H.H.Sri Sri Pedda Jeeyar Swamy of Tirumala Mutt, H.H.Sri Sri Chinna Jeeyar Swamy, Local Temples DyE.O Sri Sri Chandrasekhar Pillai, Exe Engineer Sri Jagadesswara Reddy, Suptd Smt Indira, VGO Sri Raveendra Reddy and large number of devotees took part in this function.